Thanks to Rebeca from OWN / Shed Media US for contacting us about their $25,000 giveaway! They are casting dynamic couples who are currently engaged, but lack the funds to have a dream wedding. 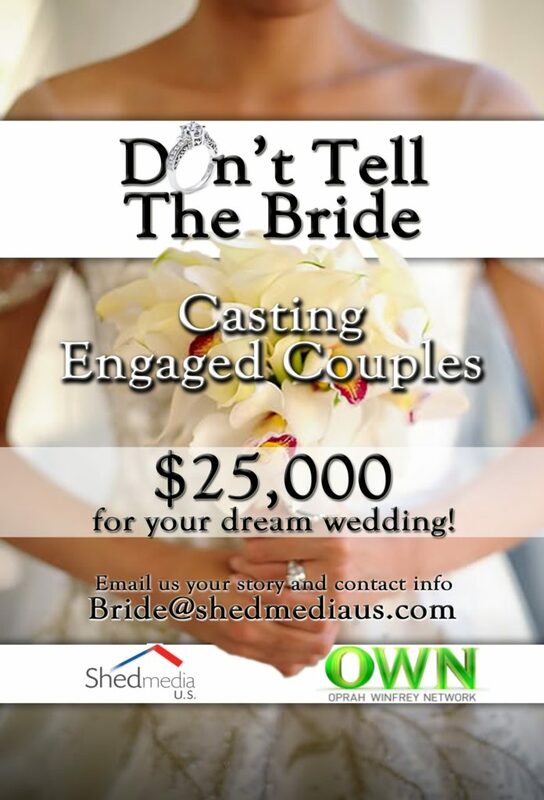 “Don’t Tell the Bride” gives $25,000 to 8 cash-strapped couples to create the wedding of their dreams. The only catch is the bride and groom can’t see each other for three weeks before the nuptials, AND the groom has to plan the whole wedding in secret (with NO input from his bride). – No long distance or destination weddings. You must be willing to marry within driving distance of couple’s residence(s). For more information or to recommend an engaged couple for the show, please contact REBECCA at 323.904.4680 x1050 OR email her at rgreenberg@shedmediaus.com with your name, age, number, city/state, photo of the couple, and brief description of why you’d be ideal for the show.